MCOLES registered class and approved for 302 funds. INTRODUCTION: Operational K9s (OpK9s) are force multipliers for local and federal law enforcement agencies, military units and Search-and-Rescue teams. They are involved in various operations such as tracking, detection (narcotics, explosives, accelerants, electronics, other), apprehension, and protection details to name a few. Due to the inherent nature of their job, it is not surprising that OpK9s are subject to various trauma-induced and environmental injuries. Expedient recognition of injuries and application of appropriate first aid and medical field care at the point of injury (POI) may be life-saving for these valued team members. Scope: The 1-day course is presented using a multidisciplinary approach focusing on prehospital care for tactical and non-tactical emergencies common to the Operational K9 (OpK9). The intent is to provide the attendee the knowledge necessary to manage immediate threats to life, limb, or eyesight, and to prepare the OpK9 for evacuation to definitive veterinary care. The curriculum incorporates current human TECC guidelines with adaptations relative to canine anatomy and physiology. Format: PowerPoint presentations accompanied by hands-on, scenario-based training and advanced skills lab (as requested). Topics of learning include: comparative K9 anatomy, restraint techniques, K9 First Aid Kits (e.g. 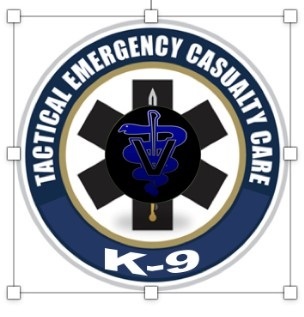 what to pack), K9 TECC Phases of Care, bandaging, bleeding control, advanced airway procedures, treatment of tension pneumothorax, care of environmental injuries, stabilization for GDV (aka. Bloat), IV/IO catheter placement, subcutaneous fluid therapy, opioid toxicity and naloxone use, and more. Dr. Lee Palmer is a board-certified Emergency and Critical Care Veterinarian that provides training and consultation in K9 Tactical Emergency Casualty Care (K9 TECC) to military, law enforcement and Search and Rescue (SAR) K9 handlers as well as Tier 1 operators and civilian tactical EMS (TEMS) personnel. He has served in the military since 1996 in both active and reserve status in the roles of a Senior Explosive Ordnance Disposal Technician and as a veterinarian in the US Army Veterinary Corps. Ben Sonstrom began his public safety career in 1990 as a firefighter / paramedic in New England. He has been actively involved in Tactical Emergency Medical Support (TEMS) since 1999. Currently, Ben is a law enforcement officer in the State of Michigan and has experience policing some of America’s most violent neighborhoods. He is a sought-after law enforcement trainer in the disciplines of firearms and medical care. His extensive TEMS experience includes providing and overseeing tactical medical operations, instruction and curriculum development on the local, state, and national level. He developed the Critical Incident Casualty Management program and has provided instruction to public safety agencies throughout the United States.